The full official trailer has been released for Batman v Superman: Dawn of Justice, and it provided a lot of the details of the story that we are going to see in the film, set to hit theaters March 25, 2016. I will take this opportunity to let you know that massive spoilers follow as the trailer leaves very little to the imagination. It opens with the meeting between two of our three leading men, as Bruce Wayne, played by Ben Affleck, comes face to face with Clark Kent, played by Henry Cavill. The idea of Batman being seen as a rogue vigilante comes up as an ethical dilemma between the two and lines are drawn. This is interesting because it seems to indicate that this is early in the career of Batman, leaving us to wonder where, if anywhere, the Nolan films would fit within the Man of Steel timeline/chronology. It might be too much to expect as much cinematic continuity as Marvel, but seeing as how it’s their leading competition, and including the most profitable DC films to date as main canon is only logical, it is a dubious choice to ignore their place in a timeline. While it is good to show tension here, I don’t like how it is broken up by the curiously cast Jesse Eisenberg as Luthor. He is shown to be disarmingly charming and funny and is meant to serve as a ruse as he hides his true malevolent intentions, but he just seems too juvenile in his brief scene here. Personally, I always liked the portrayal in the animated series, and thought that this role would have been a perfect fit for Morris Chestnut. We are then shown a brief shot of Jeremy Irons, who is billed to play Alfred, issuing a word of warning about going up against the Man of Steel, saying that it would be all out war. Wayne rebukes him, saying that Superman brought the war on us, making reference to the collateral damage done during the fight with Zod in the previous movie. While that conversation is occurring, we are shown an unseen shot from the previous film of said battle from the perspective of an awed angry and fearful Bruce Wayne, protecting a wounded child in the ruins of Metropolis. Again, this leads us to believe that that Wayne was either not in Gotham on some kind of business trip or holiday, or that it might even be AFTER the events of The Dark Knight Rises, if Man of Steel intends to run along a continuous cinematic structure. Superman, Wonder Woman and Batman hold a new villain at bay in the full trailer for Batman v. Superman. The next scenes of the trailer show various battle shots between an additionally armored Batman desperately fighting what appears to be a very angry Superman. As this is occurring, we hear Luthor explaining to Lois Lane that this is the battle between two gladiators; only for her to rebuke him and call him psychotic. This would imply that this battle wasn’t necessarily just a heated argument of ethics gone awry between DC’s leading men, but rather their confrontation was orchestrated by the traditionally Machiavellian Luthor; something I’ve been pleading for over a decade. The second quote that would seem to indicate this comes later; as he states before one of the biggest reveals of the trailer, “If man can’t kill God, then the devil will have to step in.” It is not a huge leap to assume that he had coerced or otherwise convinced Batman that Superman had to be stopped. And with Superman clearly having an advantage in the fight, shown by unmasking a bound and beaten Dark Knight, it looks as though Lex would have to play a bigger trump card to stop his longtime rival. The last minute shows three huge bombshells, and each one could receive its own essay length fan theory. First, we are shown Lex Luthor receiving the corpse of General Zod. What he intends to do with it is largely unknown, until we are shown the super villain likely to end the battle between Superman and Batman: Doomsday. Yes, the character that single-handedly killed the Man of Steel in both the comics and in the animated film Doomsday with his bare hands is shown for a full second and is clearly brought in to stop the Man of Steel and Gotham’s protector. As the villainous Doomsday charges with an eye laser attack – a power that he has never demonstrated in other mediums, but one that General Zod has repeatedly- the blast is deflected by the shield of Wonder Woman. Neither Batman nor Superman know who she is, and are unsure of her allegiances, so it is possible that this will be her introduction in the film. 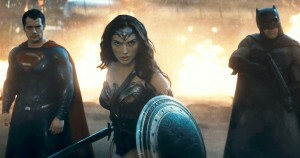 This could raise the ire of fans as many are anxiously anticipating the big screen debut of Wonder Woman. However, speculation aside, Gal Gadot’s look as the fierce amazon is both impressive and very true to her comic counterpart. Zack Snyder is also slated to direct Justice League part 1 and part 2 in 2017 and 2019 respectively, so that would explain the absence of noted characters Flash, Green Lantern, Martian Manhunter and Green Arrow from the cast, and why Jason Mamoa’s Aquaman wasn’t in the trailer. I am happy with this decision so they’re not trying to do too much with this film, and it is likely they are only going to have the big three tease the idea of working together in the future instead of trying to cram everything in at once. As for how this film looks based solely on the trailers thus far, I say don’t get your hopes too high. There is going to some spectacular action, as well as positive steps forward for DC creating a large scale cinematic universe, but some aspects are going to definitely irritate purist fans. Come March, we’ll see if this the super hero movie we sorely need, or the one that we deserve.